Because driving is so commonplace, we tend to overlook the inherent danger that we face every time we get behind the wheel. In addition, most car accidents are caused by surprisingly common behaviors and ordinary events. If you’ve been in a car accident, chances are that one of the issues below is to blame. Distracted driving. Even though we hear about the dangers of distracted driving every day, it continues to be a leading cause of car accidents in the United States. The most well-known distraction is the ubiquitous smartphone, but remember that distractions can come in many forms – eating while driving, dealing with young children, and talking with your passengers. Speeding. When you speed, it reduces the amount of time you have to react to road hazards and avoid possible accidents. In addition, it changes how your vehicle handles and increased the distance you need to stop safely. Drowsy driving. Driving while fatigued is a serious issue in the United States. While statistics are hard to come by, the National Highway Traffic Safety Administration estimates that 795 people were killed in accidents caused by drowsy driving in 2017. Driving while intoxicated. The NHTSA also reports that in 2017 one person died in a drunk driving accident every 48 minutes. Georgia ranks 21st in the nation for drunk driving fatalities. While we’re glad that our state is not in the top ten, we are in the top 50 percent, indicating that drunk driving causes too many car accidents across Georgia. In addition, keep in mind that driving while under the influence of drugs, either illicit or prescription, can be just as dangerous and just as likely to cause an accident. Running red lights. This may seem obvious – if you enter an intersection when the light is red, you are at risk of hitting another car that is proceeding through the intersection. However, too many people try to beat the red light by speeding up when the light turns yellow. The end result is that the light turns red and an accident occurs. Tailgating. Following too close to the car in front of you is a dangerous, and illegal, practice that you see on our roads every day. In the event that the car in front has to stop, the driver who is tailgating will probably cause a rear-end accident. Tailgating combined with distracted driving is a combination that will almost certainly result in an accident. Weather conditions. Snow, ice, and even rain can cause the road surface to become unexpectedly slippery, causing drivers to lose control of their vehicles or become unable to stop in time. In addition, bad weather tends to reduce visibility, making it difficult to see oncoming vehicles, turns, and other road hazards. Even though these causes are quite common, that doesn’t mean that no one is at fault in your accident. In fact, these causes are either examples of negligence or result in accidents because the drivers were careless. 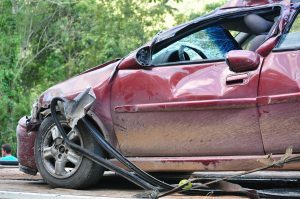 If you’ve been injured in a car accident caused by one of the factors above, the negligent driver should be held accountable. The attorneys at Slappey & Sadd can explain your options, evaluate your case, and help you get the compensation you may be entitled to. If you’d like to speak with one of our experienced car accident attorneys about your case, call us at 888-474-9616 or contact us online to schedule a free consultation.